The 64th annual Cannes Film Festival was held from 11 to 22 May 2011. American actor Robert De Niro served as the president of the jury for the main competition and French filmmaker Michel Gondry headed the jury for the short film competition. South Korean film director Bong Joon-ho was the head of the jury for the Caméra d'Or prize, which is awarded to the best first-time filmmaker. Midnight in Paris, written and directed by Woody Allen, opened the festival. Mélanie Laurent hosted the opening and closing ceremonies. Italian film director Bernardo Bertolucci was presented with the third Honorary Palme d'Or Award at the opening ceremony of the festival. Though the award had been given out sporadically in the past the Honorary Palme d'Or was supposed to presented annually after 2011. However it was not given again until the 2015 Cannes Film Festival. Gus Van Sant's Restless opened the Un Certain Regard section. Jailed Iranian film directors Jafar Panahi and Mohammad Rasoulof were honoured at the festival. Goodbye by Rasoulof and Panahi's This Is Not a Film was screened at the festival, and Panahi was awarded the Carrosse d'Or. Four female directors featured in the main competition: Australian Julia Leigh, Japan's Naomi Kawase, Scottish director Lynne Ramsay and France's own Maïwenn Le Besco. Danish film director Lars von Trier caused controversy with comments he made at the press conference of his film Melancholia. When he was asked about the relation between the influences of German Romanticism in the film and his own German heritage, the director made jokes about Jews and Nazis. He said he understood Adolf Hitler and admired the work of architect Albert Speer, and jokingly announced that he was a Nazi. The Cannes Film Festival first issued an official apology for the remarks the same day and clarified that Trier is not a Nazi or an antisemite, then declared the director "persona non grata" the following day. The film remained in competition. Robert De Niro, president of the jury, during the festival. The Palme d'Or was won by the American film The Tree of Life directed by Terrence Malick. Two of the film's producers, Bill Pohlad and Sarah Green, accepted the prize on behalf of the reclusive Malick. The Tree of Life is the first American film to win the Palme d'Or since Fahrenheit 9/11 in 2004. Head of the jury, Robert De Niro, said it was difficult to choose a winner, but The Tree of Life "ultimately fit the bill". De Niro explained, "It had the size, the importance, the intention, whatever you want to call it, that seemed to fit the prize." The line-up for the International Critics' Week was announced on 18 April at the section's website. Declaration of War, directed by Valérie Donzelli, and Bachelor Days Are Over, directed by Katia Lewkowicz, were selected as the opening and closing films of the Semaine de la Critique section. The following films were selected to be screened in the Cannes Classics section. ↑ "Festival de Cannes 2011". festival-cannes.com. Archived from the original on 2 February 2011. Retrieved 1 January 2011. ↑ Hopewell, John; Keslassy, Elsa (6 January 2011). "Robert De Niro to head Cannes jury". Variety. Retrieved 6 January 2011. 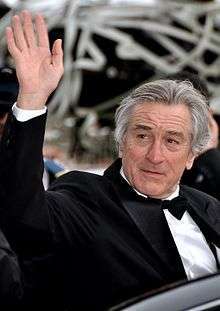 ↑ "Robert De Niro to head Cannes Film Festival jury". BBC News. 6 January 2011. Archived from the original on 7 January 2011. Retrieved 6 January 2011. ↑ "Michel Gondry to head short film jury at Cannes". BBC News. 23 February 2011. Archived from the original on 24 February 2011. Retrieved 23 February 2011. ↑ "Bong Joon-ho to head Cannes debut filmmaker panel". BBC News. 8 April 2011. Archived from the original on 9 April 2011. Retrieved 8 April 2011. 1 2 Leffler, Rebecca (2 February 2011). "Woody Allen's 'Midnight in Paris' to Open Cannes Film Festival". The Hollywood Reporter. Archived from the original on 2 February 2011. Retrieved 2 February 2011. ↑ "Woody Allen's film featuring Carla Bruni opens Cannes Film Festival". RFI. 12 May 2011. Retrieved 12 May 2011. ↑ "Cannes 2011 : Carla Bruni, Mélanie Laurent et les films attendus!". Yahoo. Retrieved 5 March 2011. ↑ "Bernardo Bertolucci to receive Palme d'Or honour". BBC News. 8 April 2011. Archived from the original on 12 April 2011. Retrieved 12 April 2011. ↑ "A Honorary Palme at the opening ceremony of the Festival de Cannes". Retrieved 3 September 2015. ↑ Leffler, Rebecca (13 April 2011). "Gus Van Sant's 'Restless' to Open Cannes Un Certain Regard". The Hollywood Reporter. Retrieved 13 April 2011. ↑ "Cannes Film Festival to honour jailed Iranian directors". BBC News. 11 May 2011. Archived from the original on 11 May 2011. Retrieved 11 May 2011. ↑ "Women to Watch at Cannes". RFI. Retrieved 12 May 2011. ↑ Higgins, Charlotte (10 May 2011). "Palme pioneers: women directors at Cannes". The Guardian. UK. Retrieved 12 May 2011. ↑ Higgins, Charlotte (18 May 2011). "Lars von Trier provokes Cannes with 'I'm a Nazi' comments". The Guardian. UK. Retrieved 18 May 2011. ↑ Staff writer (18 May 2011). "Cannes Film Festival Condemns Lars von Trier's Nazi Comments". The Hollywood Reporter. Archived from the original on 22 May 2011. Retrieved 18 May 2011. ↑ Catherine Shoard (19 May 2011). "Cannes film festival bans Lars von Trier". The Guardian. UK. Retrieved 19 May 2011. ↑ "Lars Von Trier 'accepts' Cannes ban after Nazi comments". BBC News. 20 May 2011. Archived from the original on 20 May 2011. Retrieved 20 May 2011. ↑ "Around the selection 2011 : Caméra d'or". festival-cannes.com. Cannes Film Festival. Retrieved 29 March 2015. 1 2 "Malick's drama The Tree of Life triumphs in Cannes". BBC News. BBC. 22 May 2011. Archived from the original on 23 May 2011. Retrieved 22 May 2011. 1 2 3 4 Germain, David (22 May 2011). "Malick's 'Tree of Life' wins top Cannes fest honor". Forbes. Forbes publishing. Retrieved 22 May 2011. 1 2 "Official selection 2011". festival-cannes.com. Cannes Film Festival. Archived from the original on 15 May 2011. Retrieved 14 April 2011. ↑ "Sélection 2011". quinzaine-realisateurs.com. Retrieved 20 April 2011. ↑ "Cannes' 50th Critics' Week Lineup Announced". Indiewire. Retrieved 29 March 2015. ↑ "50th Edition International Critics' Week Selection - 2011". semaindelacritique.com. Retrieved 29 March 2015. ↑ "Cannes Classics 2011". Cannes Film Festival. Retrieved 30 March 2015. ↑ "Around the selection 2011 : Cannes Classics". Cannes Film Festival. Retrieved 30 March 2015. ↑ "The Jury of the 64th Festival de Cannes". Cannes. 20 April 2011. Retrieved 20 April 2011. ↑ "Jude Law and Uma Thurman join Cannes jury". BBC News. 20 April 2011. Archived from the original on 21 April 2011. Retrieved 20 April 2011. ↑ "Jude Law, Uma Thurman among 8-member Cannes jury". Boston Globe. 20 April 2011. Retrieved 20 April 2011. ↑ "Jury". Semaine de la Critique. Retrieved 28 April 2015. ↑ Leffler, Rebecca (21 May 2011). "Un Certain Regard Announces Top Prizes (Cannes 2011)". The Hollywood Reporter. Archived from the original on 22 May 2011. Retrieved 21 May 2011. ↑ Tartaglione, Nancy (20 May 2011). "Take Shelter wins top prize at Cannes Critics Week". Screen Daily. Retrieved 20 May 2011. ↑ Hopewell, John (21 May 2011). "'Le Havre' win top Fipresci crits' award". Variety. Retrieved 21 May 2011. ↑ Nissim, Mayer (21 May 2011). "'The Artist' Uggy wins 2011 'Palm Dog'". Digital Spy. Retrieved 21 May 2011. ↑ "Skoonheid, Queer Palm 2011". L'Express (France). 21 May 2011. Retrieved 23 May 2011. ↑ ""Les Géants" et "Atmen" primés à la Quinzaine des Réalisateurs". AlloCiné. 21 May 2011. Retrieved 17 April 2012. Wikimedia Commons has media related to 2011 Cannes Film Festival.